A few weeks ago I wondered aloud about the idea of “moral orthodoxy”–whether there was some sort of corresponding standard of right moral practice that functioned comparably to the Apostles’ or Nicene Creed when it came to theological orthodoxy. Since then, we’ve chatted about the issue with the Mere Fidelity boys, and Trevin Wax has had an extremely helpful post arguing that defending the faith is about life, not just doctrine. The rule for holiness is the law, in particular the Ten Commandments. Christians don’t always agree on how to view the law (something I’ll say more about in the next chapter), but historically the church has put the Ten Commandments at the center of its instruction for God’s people, especially for children and new believers. For centuries discipleship instruction (catechesis) has been based on three things: the Apostles’ Creed, the Lord’s Prayer, and the Ten Commandments. If you wanted the basics of the Christian faith, you learned these three things. And if you wanted to know how to live a holy life, you followed the law of God summarized in the Ten Commandments. You may think of the Ten Commandments as a painful memorization exercise for five-year-olds, but the “Ten Words” (or Decalogue) from Exodus 20 are central to the ethics of the New Testament. For Jesus and the apostles, the Ten Commandments provided a basic summary of God’s ethical intentions for everyone everywhere.11 When a rich young man asked Jesus what he must do to inherit eternal life, Jesus replied, “You know the commandments,” and he listed the commands in the so-called second table of the law (Mark 10:19). The only “horizontal” command he didn’t mention was “do not covet.” And that’s because he wanted to expose the rich man’s greed. True, Jesus used the law in this instance for its convicting power more than anything else, but it still shows the place the Ten Commandments held as a summary of God’s will (cf. 1 Tim. 1:8–11). We see the same thing in Romans 13:9, where Paul rattles off four of the commandments and makes reference to “any other commandment.” What’s amazing is that Paul says in verse 8, “Owe no one anything, except to love each other, for the one who loves another has fulfilled the law.” Then he moves on to the Ten Commandments. Obeying the commandments is how we fulfill the law of love, and love is at the heart of holiness (v. 10). If you care about love you will love to obey the Ten Commandments. 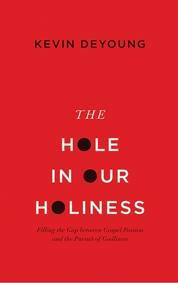 —The Hole in Our Holiness: Filling the Gap between Gospel Passion and the Pursuit of Godliness (Kindle Locations 645-660). Crossway. Kindle Edition. While DeYoung isn’t looking to weigh in specifically on the question I was asking, his line of argument here seems to give biblical, and especially New Testament heft to my suggestion. When we are believing and pursuing the Gospel we become Godly by accident. I’ve appreciated some of the recent reflection on “moral orthodoxy,” and I think it’s an important discussion. But it seems to me that DeYoung, at least in this quote, has reversed the New Testament pattern, wherein loving God and loving neighbor fulfills the law. His quote, specifically in the final paragraph, reverses that idea by saying that in obeying the law, we have loved. This is a problem. Sounds like you are saying the same thing. I think What DeYoung is getting at is not what you are suggesting. Those who have been regenerated by The Spirit, have a new heart, new mind and a new desire, a desire for holiness and not sin. Even when the christian is at is deepest in sin, his heart still cries out to be done with it and towards God. In fact, those who have this desire will love to obey the ten commandments with a joy and passion, which is what Calvin suggests is the third use of the Law. I think I see what you’re saying, but I still think there is a subtle problem. I don’t want to be a pain, but there is a logical order here that needs to be maintained. As an imperfect analogy: 1 John says that God is love. But it would not be synonymous or acceptable if someone were to say “love is god.” Words need to be properly ordered to avoid distortion and provide the correct categories. Saying “law fulfills love” reverses the New Testament pattern, perhaps (unintentionally) promoting a legalistic, checklist mentality rather than shaping the more relational disposition of loving God and neighbor. It is in the person of Christ that we see the love of God, the love of neighbor, and the law fulfilled. For us, freedom is the watch word and the law is merely so we sinners can live together as best as is possible in a sinful world…and then theologically, to expose us and drive us to Christ. Derek, have you had a chance to read DeYoung’s newest book, Taking God at His Word? I would love to hear your thoughts on it. As someone who ministers in a similar context, I think it could be useful for student ministry. God bless brother! No, I have not, but I look forward to it. I’ve heard good things.